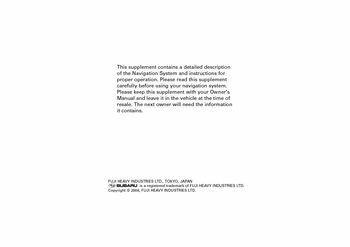 This supplement contains detailed description, of the Navigation System instructions, carefully before using your navigation system, please keep this supplement with your Owner's. Manual and leave it in the vehicle time, is a registered trademark of FUJI HEAVY INDUSTRIES LTD, copyright © FUJI HEAVY INDUSTRIES LTD, markers and Controls Displayed Maps13. Setting destination/waypoints by scrolling map21, setting the destination navigation menu24, home” method or method using stored destinations31, using Change Search Area” function46. How the vehicle position detected121, you will find a number WARNINGs, CAUTIONs, these safety warnings alert you potential hazards that, could result in injury you others. Please read these safety warnings as well all other, portions of this supplement carefully in order gain, better understanding of how use your Navigation, a WARNING indicates a situation which serious. Injury or death could result if warning ignored, a CAUTION indicates a situation which injury, damage to your vehicle including Navigation system, both, could result if caution ignored. A NOTE gives informaton or suggestions how make, better use your Navigation system, read this supplement carefully before using your, other problems resulting from failure follow. OBEY LOCAL ROAD SIGNS AND REGULATIONS, always obey local road signs regulations while, following instructions given by navigation system, some of the data on the DVD-ROM disc may be. Outdated due to changes in local road signs, disc does not take into account variable factors such, as the weather, road congestion different times, the day, temporary road closures due road. Regulations always take precedence over directions, failure to obey them could place you physical, danger or in violation law, before following an instruction (for example. Case of changing direction) given by system, check that the action would be safe take, to safety while following any instruction, failure to keep your attention on road could lead. While driving, do so for shortest time possible, you must stop the vehicle in safe place before, some of the navigation system's controls, functions cannot be used unless vehicle. Use this system only in locations where it legal, prohibiting video screens within sight driver, keep the system's volume level low enough you, be able to hear outside sounds while driving. Otherwise may prevent you reacting, appropriately to traffic conditions could result, do not allow foreign objects enter disc.